Thanks to our proud sponsors O’Briens Garage and Maureen’s Pub, Mallow. 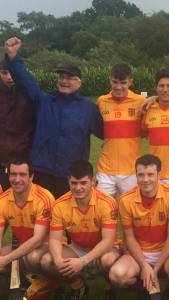 Mallow crowned Junior B North Cork Champions..
Mallow- Padraig Buckley, Eamonn Crowley, Gavin O’Sullivan, Ciaran Murphy, Brian O’Riordan, John Healy, Rory Downey, Mark Roche, Kenneth Mills, Michael Maher, Fionn Moynihan, Jimmy Glynn, Brian Murphy, Fergal McCormack, Kieran Byrne(C). Subs used Sean Glynn, Aaron Woods, Seamus Buckley, Timmy McNamara, Ed Healy. County Premier Intermediate Hurling Championship Semi Final..
For the third year running our Intermediate Hurlers find themselves in the familiar territory of the last four of the Premier Intermediate Hurling Championship race. Four will become two next Saturday when our lads take on Cloyne and Ballinhassig and Kanturk go head to head in the other Semi Final. Our game is the opening game of the double header which is at 530pm in Pairc Ui Rinn. It’s a remarkable sign of the character of this team to overcome the disappointment of the last two years to get back to the crucial stages of the competition once again. This time, no doubt, it’s not about getting further it’s about finishing the job and we all sincerely hope they get their just reward. The club would appeal to all people of Mallow to please support our lads next Saturday on what is a big day for the club and town. It is great to see some of the business’s and homes in town display their Mallow colours and we hope there might be an extra few splashes of colour over the coming days. We have every finger and toe crossed for our lads and we look forward to Saturday’s battle, which is exactly what we will get from a team such as Cloyne.. 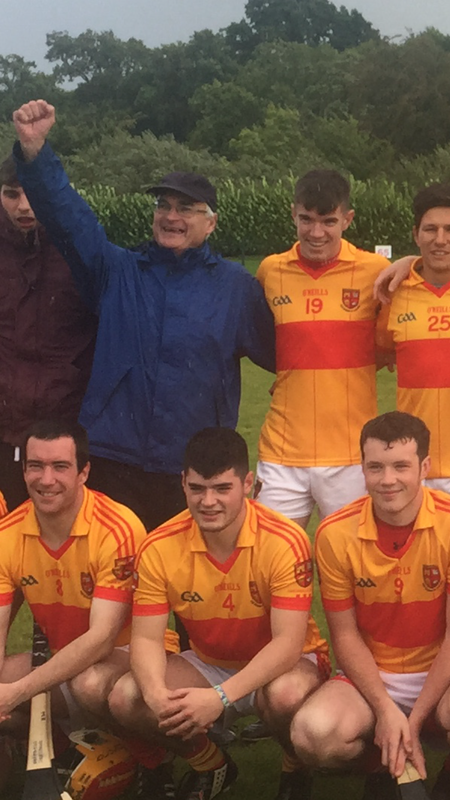 The very best of luck lads, Maghealla ABU.. Yesterday, September 13th, marked the 25th Anniversary of Mallow’s first ever Intermediate Football County championship win by that legendary team of ’92. They defeated Kilmurray, 1-13 to 2-9 and after were paraded up and down the town on an open top bus on what was a historic night for club and town. Five of that panel went on to guide the club to a Premier Intermediate Football title in 2007, which marks its ten year anniversary this year, defeating Killavullen 1-7 to 0-7. Around this time also forty five years ago, September 24th, Mallow last claimed the Intermediate Hurling title, defeating Blackrock 4-10 to 1-9… Happy anniversary to all and those who are no longer with us are always in our thoughts.. Legends all, DARE WE DREAM??? Thirty five years ago Mallow U-16 Footballers lost out, narrowly, to Douglas in the County final(proper) having won the North Cork championship and County(Country section) earlier that year. To mark the thirty fifth anniversary Douglas GAA Club are hosting a reunion of their County U16 winning team of 1982.
to all members of that team to the reunion, which takes place on Friday, September 29, at Douglas GAA Club from 8.30pm onwards. Some members of that Mallow team have expressed an interest in going and if you would like to attend or find out more please contact Dave Buckley in Meadow Grove. County Premier Intermediate Hurling Championship Semi Final Mallow V Cloyne, Saturday 16th September at 530pm in Pairc Ui Rinn.. Junior B Hurling County Qualifier Mallow V Killavullen, Sunday 17th September at 6pm in Castletownroche..
Premier U-21 Hurling Championship Mallow V Na Piarsaigh, Tuesday 19th September at 730pm in Mourneabbey..
County Premier Intermediate Football Championship Semi Final Mallow V Bandon, Saturday 30th September TBC. Jubilant Junior Hurling manager Joe Daly and his charges were in fine voice after the full time whistle last Sunday.. The victorious Mallow Junior Hurlers..
Mallow GAA Stalwart Eamonn Crowley and his family enjoying the celebrations after the game. Mallow Captain Kieran Byrne with his second cup of 2017 after also claiming the Division 2 Hurling League title. Mallow and Cork GAA legend Fergal McCormack with rising star Ciaran Murphy after last weeks game. When Fergal was climbing the steps of Croke Park to lift the Liam MaCarthy cup back in 1999, Ciaran was only two weeks old. They played side by side last Sunday with a personal McCormack tally of 1-9!! !